❖ Silky straight. Virgin Indian Hair that gets better w/each wash and condition! ❖ Silky straight. 100% Virgin Indian Hair that gets more luscious with each wash and conditioning. This naturally straight all-virgin Indian hair extension is of the highest-quality which means stronger hair follicles and ends. Our all-natural, straight virgin hair is not chemically altered or blended so that you get an unbeatable natural shine. 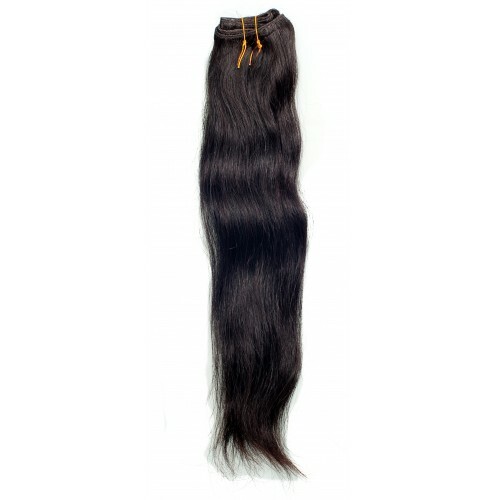 Virgin Indian Hair extensions are well known as the world's most wanted hair for extensions. Indian hair offers the lush texture, silky smoothness and long-lasting sheen that is difficult to obtain with hair-products, straighteners and other products and processes. By using extensions made from virgin Indian hair you are able to avoid using harmful chemicals which can damage your hair and skin. It also takes a fraction of the time to put-in and remove extensions compared to other processes that can take hours and require redoing more often. The ease of use, longevity, look & feel of using 100% Virgin Indian Hair extensions is what makes them so popular with women today.